Surprising Nov. sales: A 13.4 million SAAR? 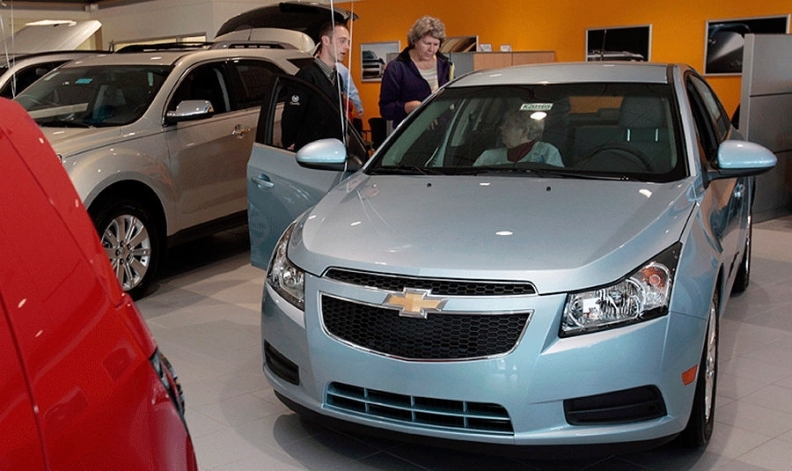 Suburban Chevrolet dealership sales person Scott Northway shows two potential customers a Chevrolet Cruze on display last month at the dealership in Ann Arbor Mich.
U.S. auto sales for November have risen sharply as consumers replace aging vehicles despite the economic turmoil in Europe and political gridlock in Washington, analysts say. November sales, to be released Thursday, Dec. 1, are expected to approach a million units and reach a seasonally adjusted annual rate of 13.4 million, up 8 percent from November 2010. The sales jump in November comes despite the crisis in the euro zone and the collapse last week of efforts by the congressional supercommittee in Washington to cut the federal deficit. "I think we're starting to see the automotive sector recover beyond what's happening in the economy," said Jim Lentz, president of Toyota Motor Sales U.S.A. Inc., at the opening of Toyota's assembly plant in northern Mississippi. Toyota and other Japanese automakers are rebuilding inventory from the depths of the March quake. Paul Taylor, chief economist at the National Automobile Dealers Association, says dealers are using high trade-in values to lure consumers back into their showrooms. "One of the important things we're seeing is the restoration of inventory for many of the brands based in Asia," he says. "We see a strong supply of trucks that suggests an increase in incentives on those vehicles through the end of the year." Jesse Toprak, vice president of forecasting at TrueCar.com, predicts big gains from November 2010: Chrysler Group, up 38 percent; Volkswagen AG, 24 percent; Hyundai-Kia, 22 percent; and Daimler AG, 21 percent. "We're going to have almost 100,000 more vehicles sold this November than last November," Toprak says. The mid-month estimate from Edmunds.com projected the November SAAR at 13.5 million and November sales at just below 1 million units, analyst Jessica Caldwell says. John Humphrey, senior vice president of global automotive operations at J.D. Power and Associates, says November's retail light-vehicle sales "are outperforming expectations," and the strengthening sales of the past three months suggest strong momentum going into 2012. Asian automakers' sales and inventories continue to recover from the March quake in Japan, but those efforts were hampered by floods in Thailand in October that closed many parts plants. Toyota's U.S. inventory slipped to a low of 120,000 vehicles earlier this year, half the level that the automaker prefers, Lentz says. "We started this month around 160,000" vehicles in U.S. inventory, Lentz says. "We will probably get to 200,000 by the end of the year, and probably February or so we will be back to 240,000." In Amarillo, Texas, Toyota sales are closing the month strong, says Mike Good, general manager of Street Toyota. "November started slow, but the last two weeks have come on like gangbusters," he says. "We expect new and used to be up 10 or 15 percent this month. The hot models are 2012 Camrys and Tundras." He expects his full-year 2011 new and used volume to rise about 13 percent from 2010 to about 3,400 units. Toprak says that, with an average vehicle age of 11 years, consumers are reaching the useful limits of their current vehicles and setting aside economic uncertainty. Shoppers are "being more comfortable buying cars and making big-ticket purchases that they have been postponing," he says. "They waited long enough. They have to get a car now." As they did in October, large pickups are gaining market share, says Jeff Schuster, senior vice president of forecasting for LMC Automotive, a research firm. Those rising pickup sales could be the result of a slightly improved construction sector. Economist Robert Dye of Comerica Bank notes that new housing permit data from October were "unambiguously good" with a 10.9 percent jump to an annual rate of 653,000 units, the highest numbers since March 2010. The rising figures "are not yet a marker of the end of the housing depression, but it is a step in the right direction."